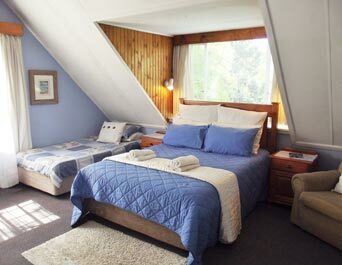 This lovely large room is a loft room upstairs, with a queen sized bed and a sleeper couch. It also has an enclosed sunroom and a deck that overlooks the pool. 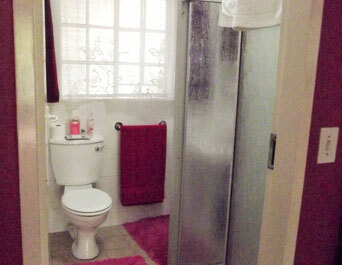 This room is a full bathroom en suite. TV, bar fridge, microwave and tea/coffee facilities are included. We are happy to accommodate a single, a double or a family in this room. DSTV and free uncapped Wifi. Rates will change accordingly. A large main room with twin single beds that can be made into a king size bed. 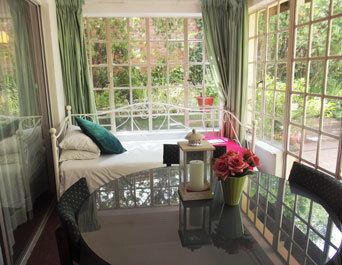 A lovely fully curtained sunroom with double bunks (for children or adults). 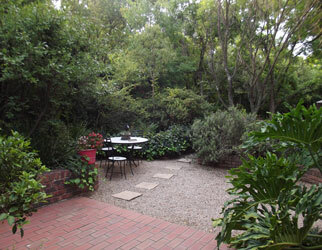 The sunroom also has tables and chairs and french doors opening onto a private garden patio. There are glass sliding doors between the rooms. This room is shower en suite. Facilities include TV, microwave, fan, bar fridge and tea/coffee facilities. Spacious quiet room for a single, couple or family. DSTV and free uncapped Wifi. Rates charged accordingly. This room is made up of a main bedroom with a queen sized bed and TV. Attached is a smaller room with double bunks (for children or adults). The smaller room has french doors that open onto a little patio with a table and chairs. 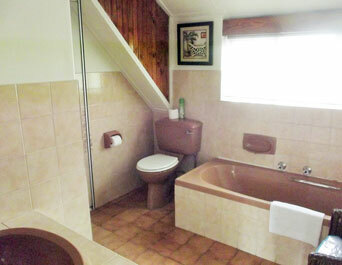 This room is full bathroom en suite. An added perk of this room is that it has its own kitchenette with table and chairs, fridge, microwave and tea/coffee facilities. Great room for a single, couple or family. DSTV and free uncapped Wifi. Rates will be charged accordingly. This nice spacious quiet room has a double bed and a divan, accommodating a single, double or family. The cupboards are stocked with gowns and slippers for the guest's trips to the bathroom, as this room is not en suite - the bathroom is in the passage alongside. 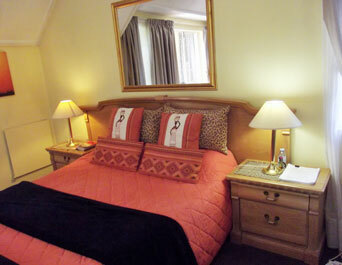 For those who want to share and get reduced rates this room is often booked with Zebra Room, also not en suite. This allows adult accommodation for up to four persons at greatly reduced rates as these two rooms would then share a bathroom. Very popular. 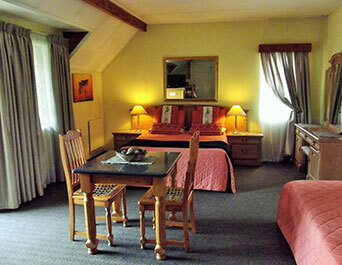 TV, DSTV, free uncapped Wifi and tea/coffee facilities in the room.. This is a cosy sunny room with a nice view of the garden. Twin single beds for a single or couple. The cupboards are stocked with gowns and slippers for the guest's trips to the bathroom, as this room is not en suite - the bathroom is in the passage alongside. 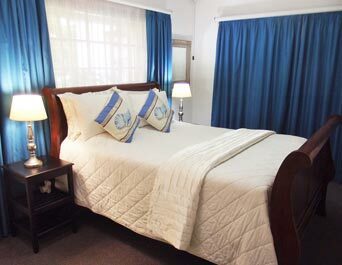 For families or those who want to share and get reduced rates this is an ideal room. Alongside is Pool View Room and the two rooms together accommodate up to four adults easily, allowing for plenty of privacy. 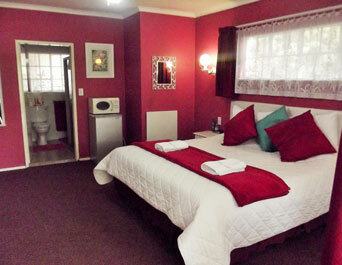 TV, DSTV, free uncapped Wifi, bar fridge, microwave, tea/coffee facilities and a fan are in the room. Really good rates! A 10% admin fee will be retained if full booking cancelled.